2 Corroboration My basic philosophy: Never trust anything that you hear from one single source In any (reasonable) court of law, testimony from the victim alone cannot be used to convict. 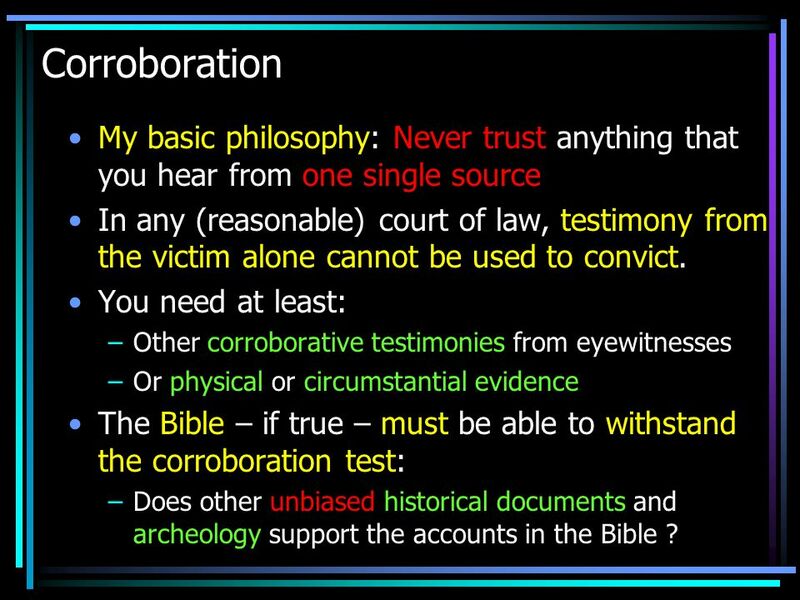 You need at least: Other corroborative testimonies from eyewitnesses Or physical or circumstantial evidence The Bible – if true – must be able to withstand the corroboration test: Does other unbiased historical documents and archeology support the accounts in the Bible ? 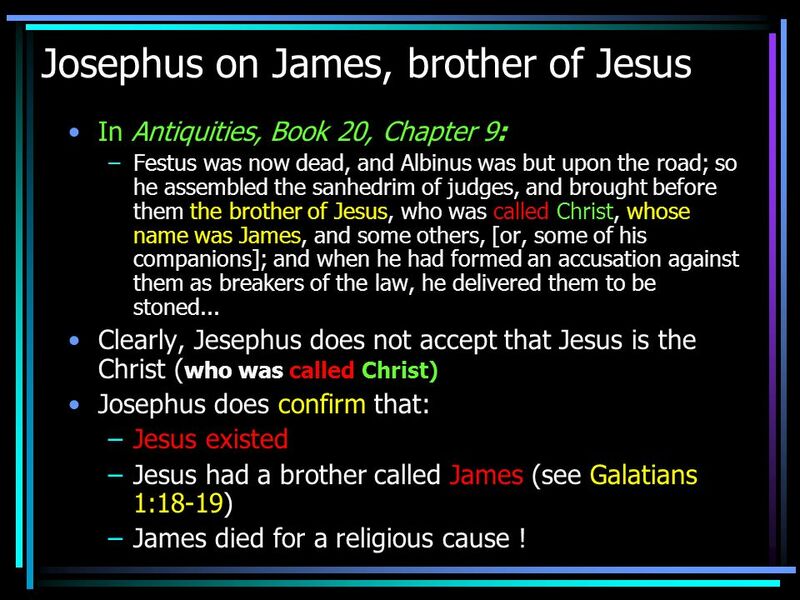 In Antiquities, Book 20, Chapter 9: Festus was now dead, and Albinus was but upon the road; so he assembled the sanhedrim of judges, and brought before them the brother of Jesus, who was called Christ, whose name was James, and some others, [or, some of his companions]; and when he had formed an accusation against them as breakers of the law, he delivered them to be stoned... Clearly, Jesephus does not accept that Jesus is the Christ (who was called Christ) Josephus does confirm that: Jesus existed Jesus had a brother called James (see Galatians 1:18-19) James died for a religious cause ! 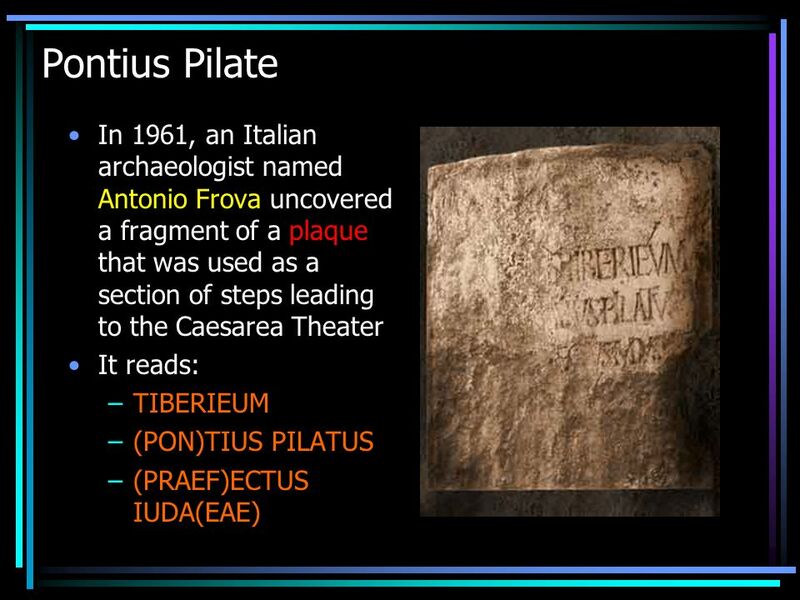 In Antiquities, Book 18 , Chapter 3 But now Pilate, the procurator of Judea, removed the army from Cesarea to Jerusalem, to take their winter quarters there, in order to abolish the Jewish laws. 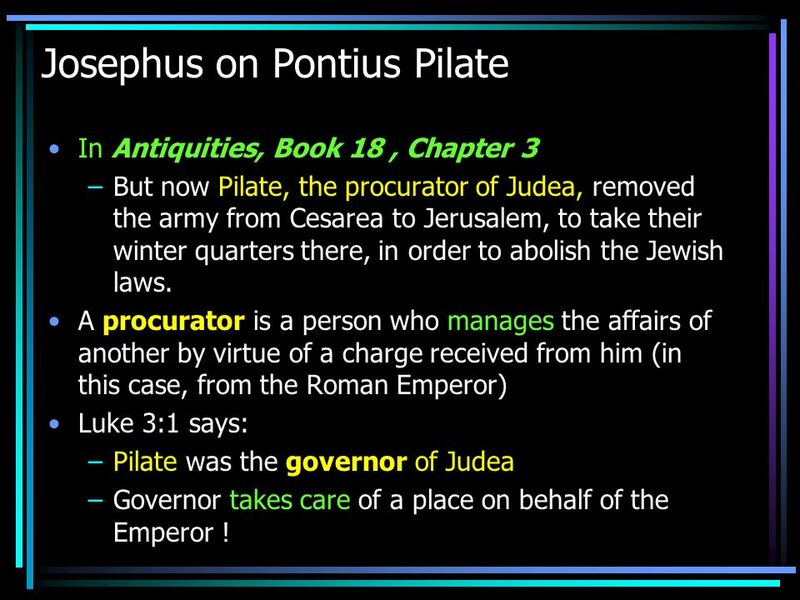 A procurator is a person who manages the affairs of another by virtue of a charge received from him (in this case, from the Roman Emperor) Luke 3:1 says: Pilate was the governor of Judea Governor takes care of a place on behalf of the Emperor ! 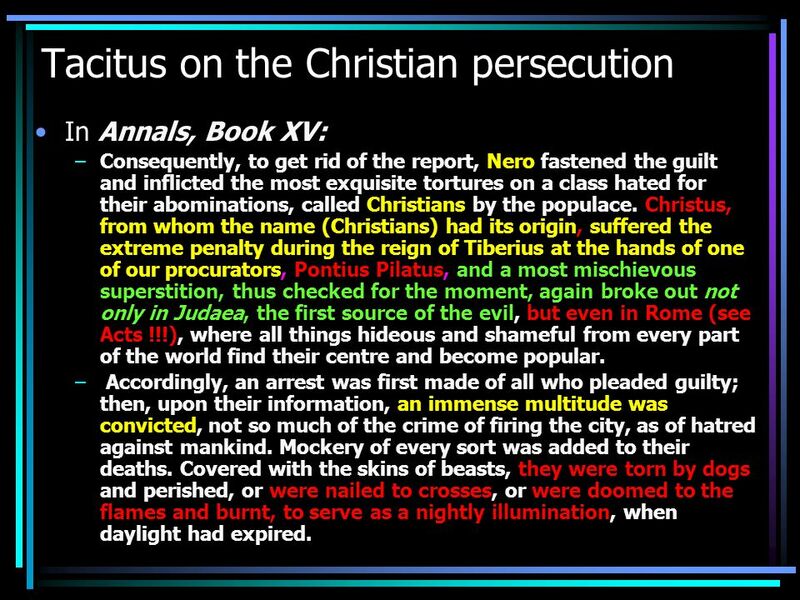 In Annals, Book XV: Consequently, to get rid of the report, Nero fastened the guilt and inflicted the most exquisite tortures on a class hated for their abominations, called Christians by the populace. 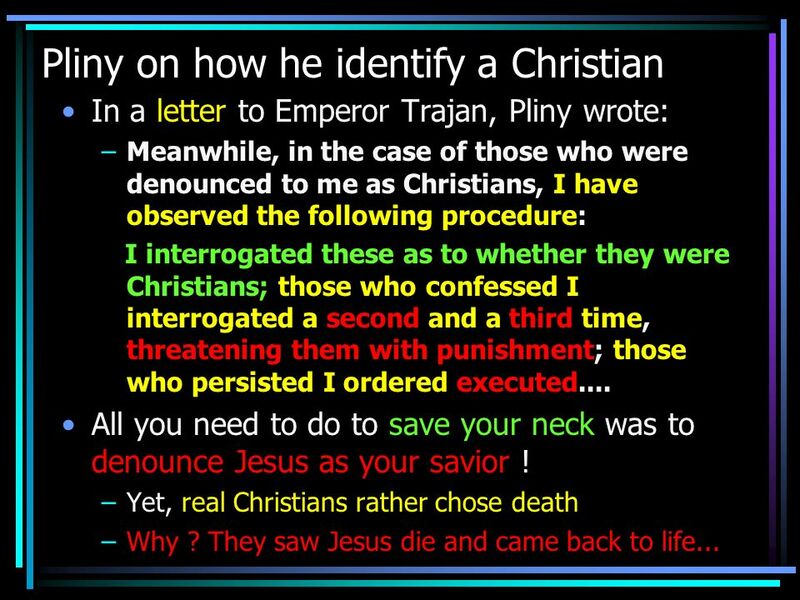 Christus, from whom the name (Christians) had its origin, suffered the extreme penalty during the reign of Tiberius at the hands of one of our procurators, Pontius Pilatus, and a most mischievous superstition, thus checked for the moment, again broke out not only in Judaea, the first source of the evil, but even in Rome (see Acts !!! ), where all things hideous and shameful from every part of the world find their centre and become popular. Accordingly, an arrest was first made of all who pleaded guilty; then, upon their information, an immense multitude was convicted, not so much of the crime of firing the city, as of hatred against mankind. Mockery of every sort was added to their deaths. Covered with the skins of beasts, they were torn by dogs and perished, or were nailed to crosses, or were doomed to the flames and burnt, to serve as a nightly illumination, when daylight had expired. Roman Historian Suetonius wrote in “Life of Claudius”: As the Jews were making constant disturbances at the instigation of Chrestus (Christ? 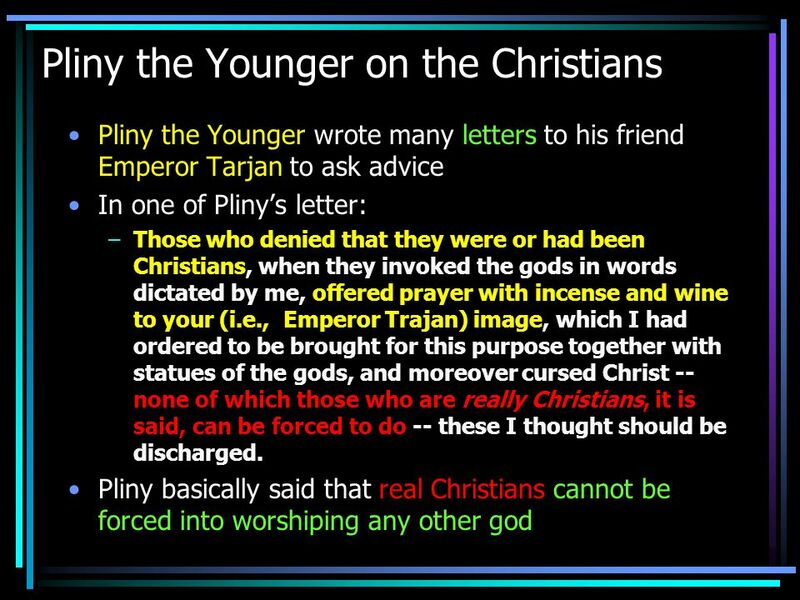 ), he (Claudius) expelled them (Jews) from Rome. 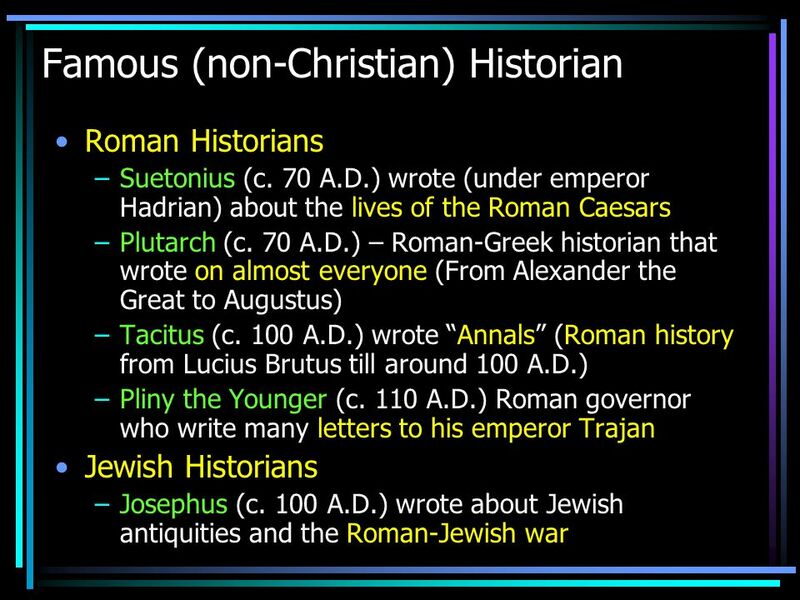 There is one other historian that wrote about the expulsion of Jews from Rome: Acts 18:2 --- There he became acquainted with a Jew named Aquila, born in Pontus, who had recently arrived from Italy with his wife, Priscilla. 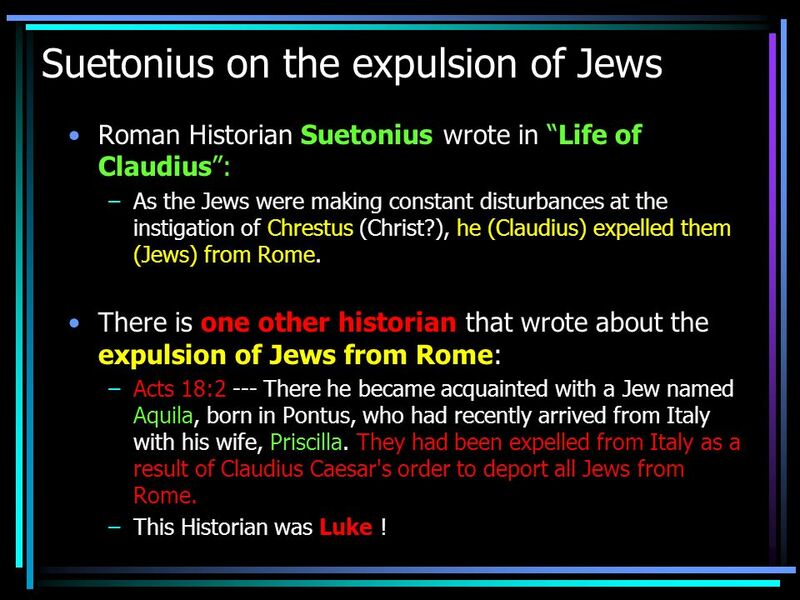 They had been expelled from Italy as a result of Claudius Caesar's order to deport all Jews from Rome. This Historian was Luke ! 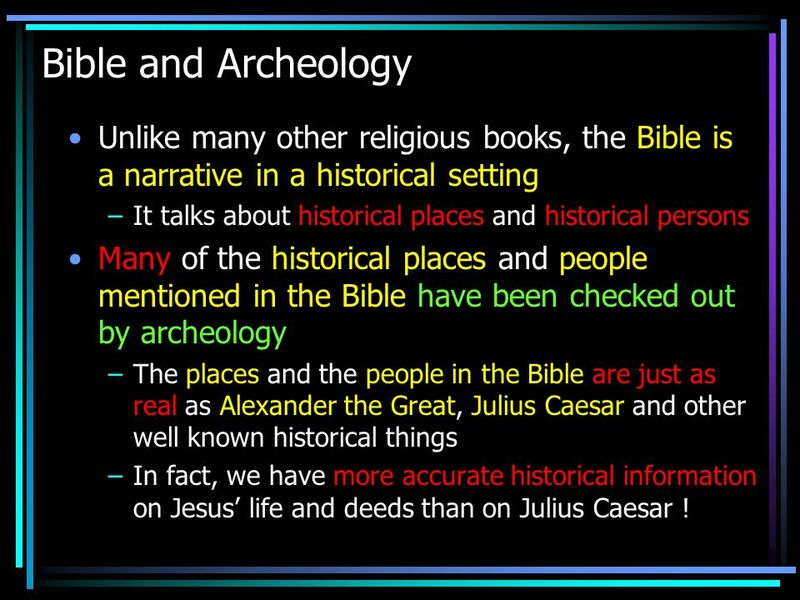 13 Bible and Archeology Unlike many other religious books, the Bible is a narrative in a historical setting It talks about historical places and historical persons Many of the historical places and people mentioned in the Bible have been checked out by archeology The places and the people in the Bible are just as real as Alexander the Great, Julius Caesar and other well known historical things In fact, we have more accurate historical information on Jesus’ life and deeds than on Julius Caesar ! 21 Strange census confirmed ! 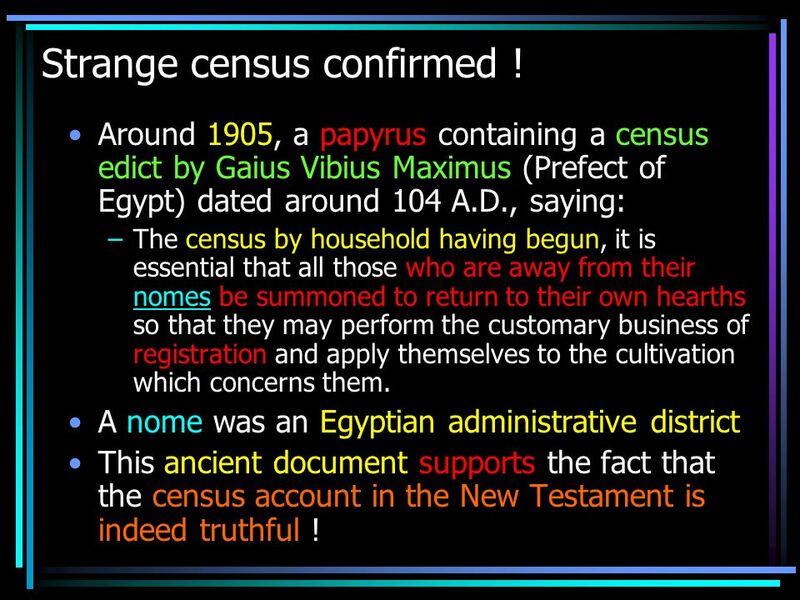 Around 1905, a papyrus containing a census edict by Gaius Vibius Maximus (Prefect of Egypt) dated around 104 A.D., saying: The census by household having begun, it is essential that all those who are away from their nomes be summoned to return to their own hearths so that they may perform the customary business of registration and apply themselves to the cultivation which concerns them. 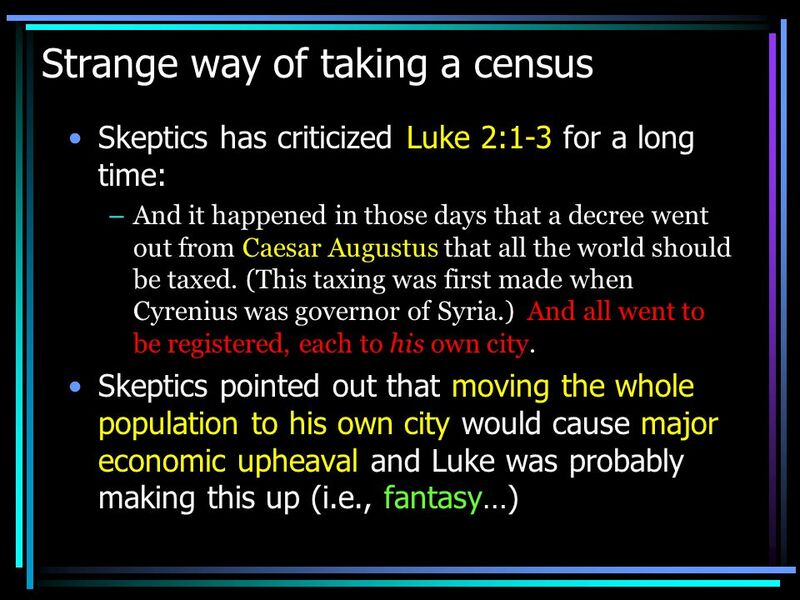 A nome was an Egyptian administrative district This ancient document supports the fact that the census account in the New Testament is indeed truthful ! 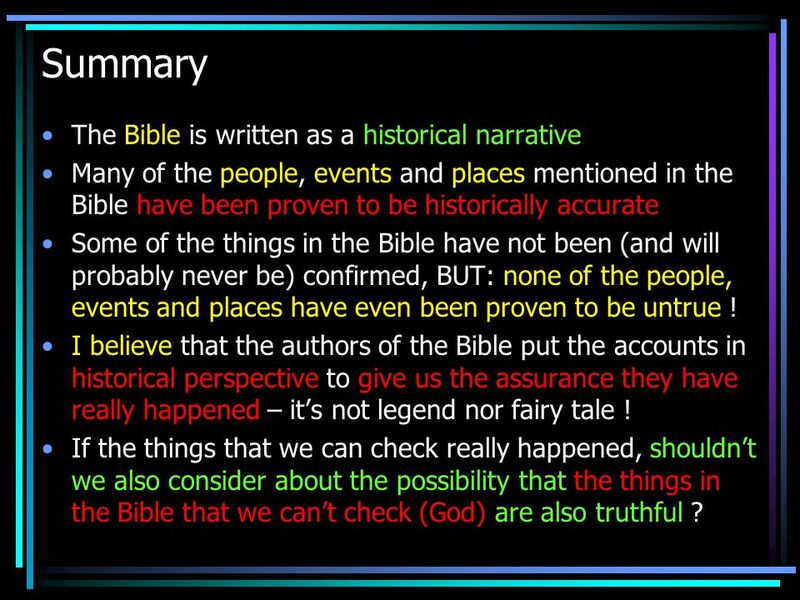 Many of the people, events and places mentioned in the Bible have been proven to be historically accurate Some of the things in the Bible have not been (and will probably never be) confirmed, BUT: none of the people, events and places have even been proven to be untrue ! 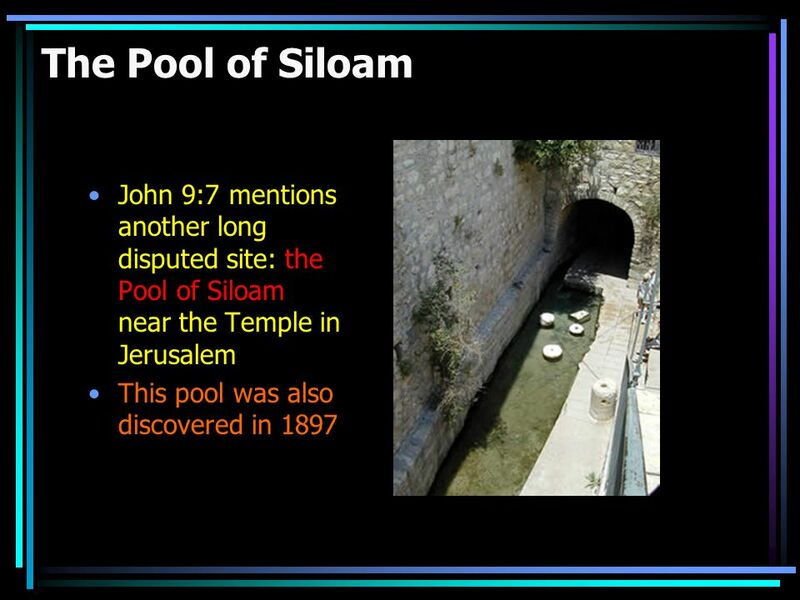 I believe that the authors of the Bible put the accounts in historical perspective to give us the assurance they have really happened – it’s not legend nor fairy tale ! If the things that we can check really happened, shouldn’t we also consider about the possibility that the things in the Bible that we can’t check (God) are also truthful ? 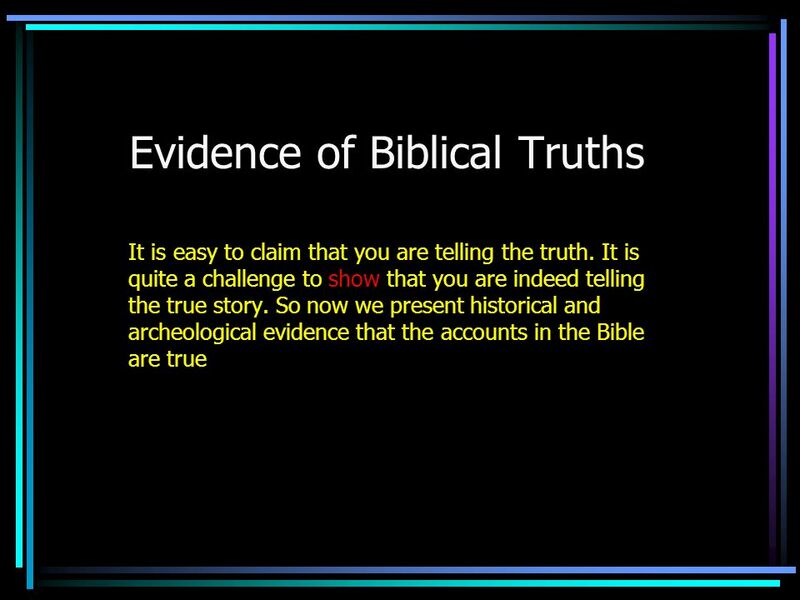 Download ppt "Evidence of Biblical Truths"
Is this Your Trust in God or the System of Faith that God has Given? Ephesians 4:1-6. …for real! JESUS IS…. Thomas Paine… ”There is no history written at the time Jesus Christ is said to have lived that speaks of the existence of such. 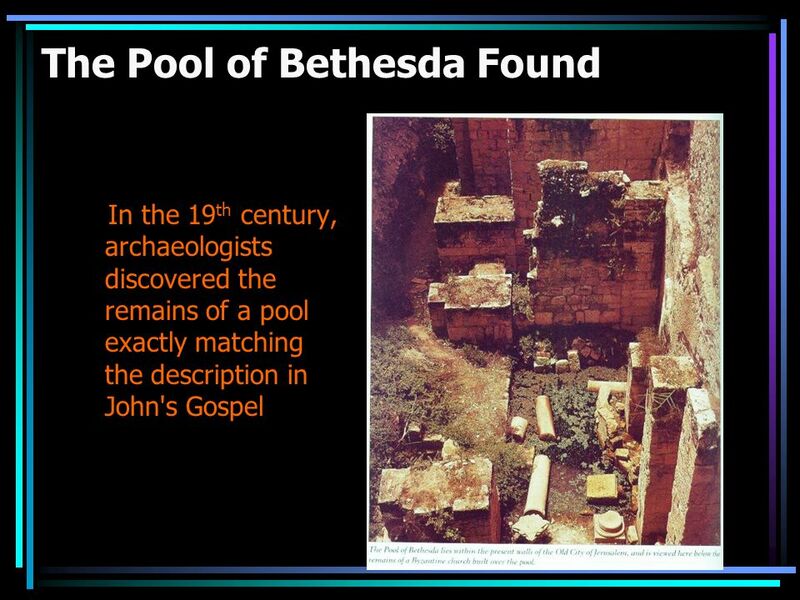 Happy Sabbath Archeological Evidence Archeological Evidence Historical Evidence Historical Evidence Prophetic Evidence Prophetic Evidence Personal Evidence. Is the Bible Reliable? Examining the Trustworthiness of the Gospels. 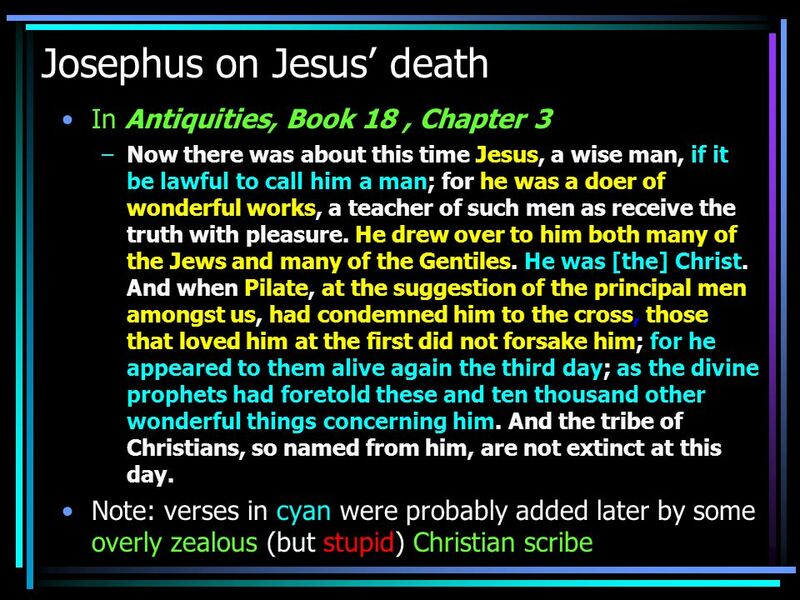 Secular historians attest to the historical reality of Jesus Christ What NON-Biblical writers had to say about Jesus Christ and Christians. Back from the Dead: Why Jesus is the One True God. Ch 1 Notes (Pgs 8-13) “Unlike Any Other”. 1. In Luke 5:4, Jesus invited some people to “put out into deep water.” When we say that Jesus is inviting you. THE HISTORICAL CHRIST. 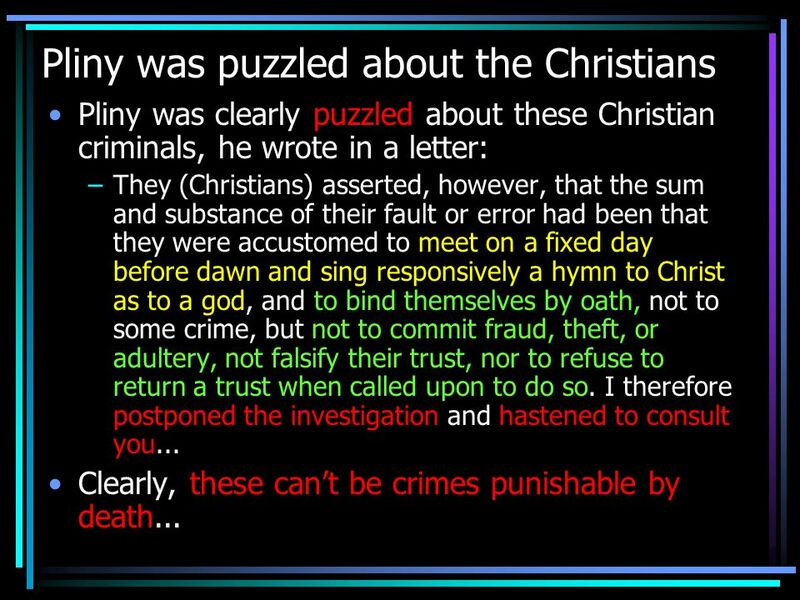 HOSTILE TESTIMONY Nero fabricated scapegoats—and punished with every refinement the notoriously depraved Christians (as they. The Christmas Carol Sing off: Option A: cue up a bunch of Christmas carols in your computer or mp3 player. Divide the group up into teams. Play the carols. Who is Jesus? The person of Jesus … one of the best kept secrets? 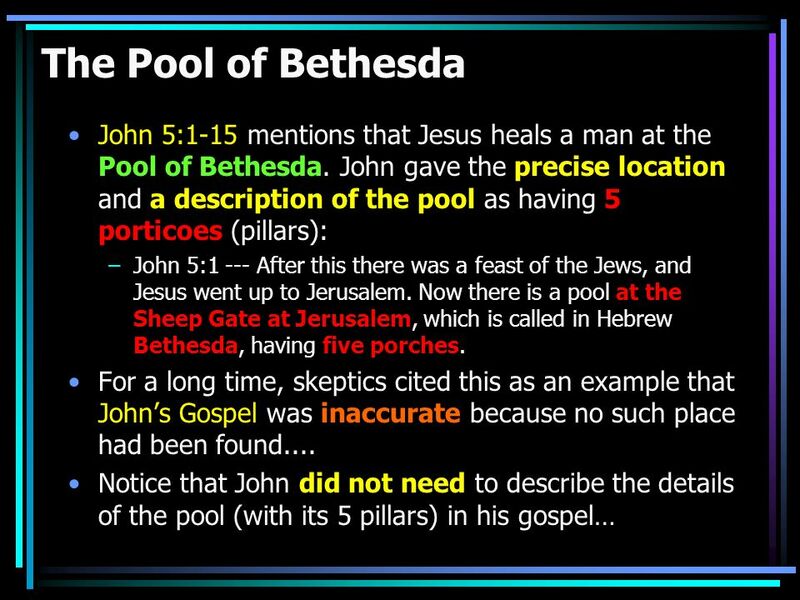 Jesus Christ: the Son of God John 1:1-5. If all we had was sources from outside of the Bible, what would we know about Jesus? Historical Evidence Concerning the Life of Jesus F. W. Mattox, The Eternal Kingdom: A History of the Church of Christ, Delight, Arkansas: Gospel Light. 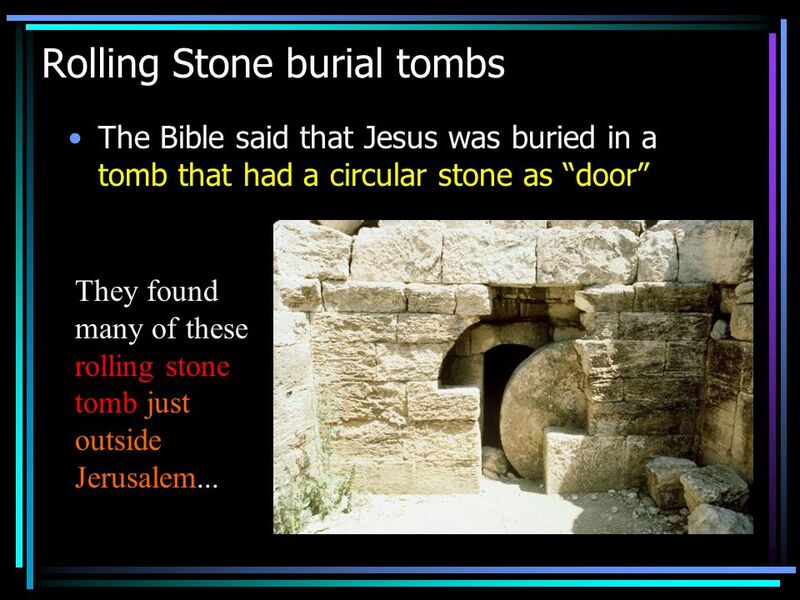 Did Jesus actually live according to secular history? Birmingham University “Focus Week” Day 2 of 5: How can this be love when... “You can’t trust the Bible”? 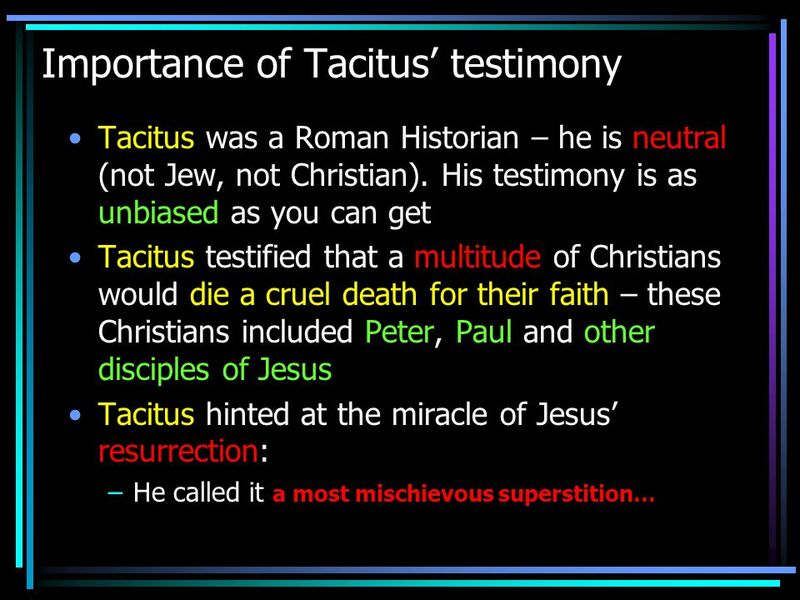 James Patrick Holding Tekton Apologetics Ministries “Skeptics silenced…. 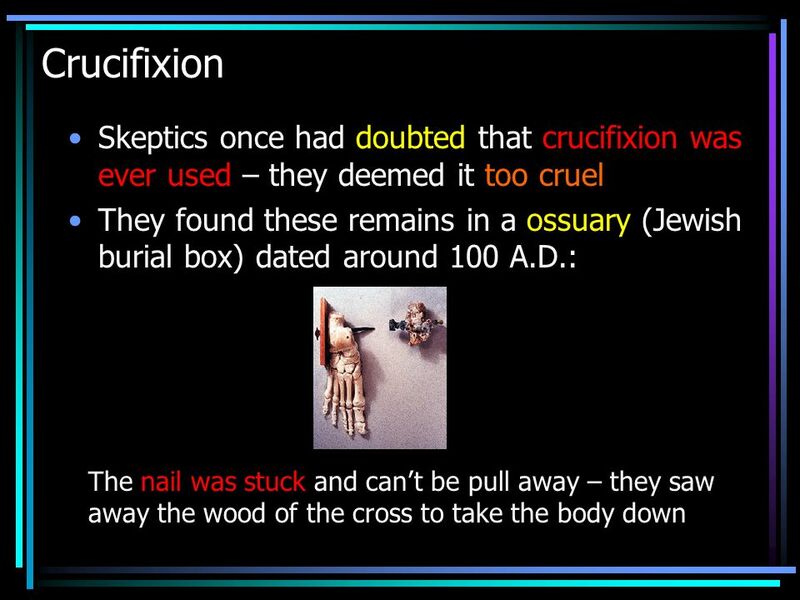 rogues refuted.” The Evidence for Jesus Two Aspects of the Case for Christ. “Unlike Any Other”.  1. In Luke 5:4, Jesus invited some people to “put out into deep water.” When we say that Jesus is inviting you to do the same, what.